Kingsway Ward, along with other wards in Halton currently has a small pot of money each year to be spent locally in the ward. Community groups can also apply for small amounts of funding if their project is for the improvement and benefit of their ward and/or ward residents. In recent times monies have been allocated to things like alley gating to improve the security of residents, Community Skip Scheme, outdoor furniture for the Fellowship Centre, extra litter bins, helping a local dance troupe, community sports equipment for the new Frank Myler Sports & Recreation Ground, which is in our ward, and a number of other projects. I’m pleased to let you know that, using Kingsway Area Forum funds, six semi mature trees have been ordered and are soon to be planted on ‘The Biggy’, the big green square in the middle of the Kingsway Estate. 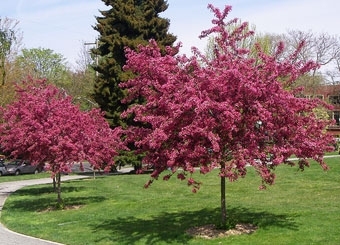 The trees chosen are Crataegus Oxycantha (Paul’s Scarlet). 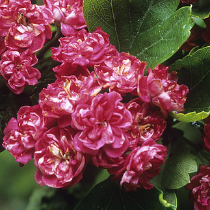 The tree is a Hawthorn that grows to form a dense rounded crown up to 10 metres tall, with dark green leaves and when in flower, clusters of double red flowers. Please see below photographs of fully grown examples. The benefits of trees in communities are well known, they’re good for the environment, can make an area look more attractive, provide habitat for wildlife and improve the sense of well being of residents, amongst many other benefits. It is hoped that we will be able to achieve more in the future to make this large patch of green space a more attractive area for local residents to enjoy.